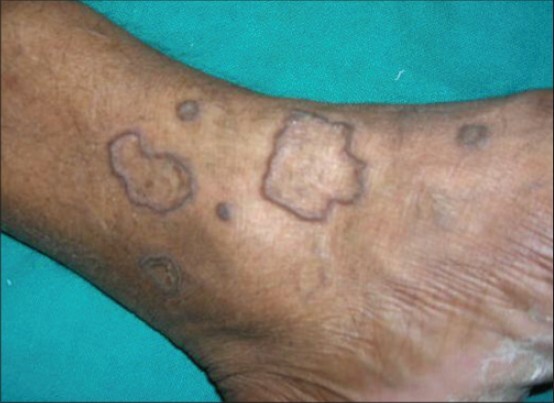 Porokeratosis (PK) is a disorder of keratinization characterized by annular plaques with normal or atrophic centers surrounded by a keratotic ridge [Figure 1]. 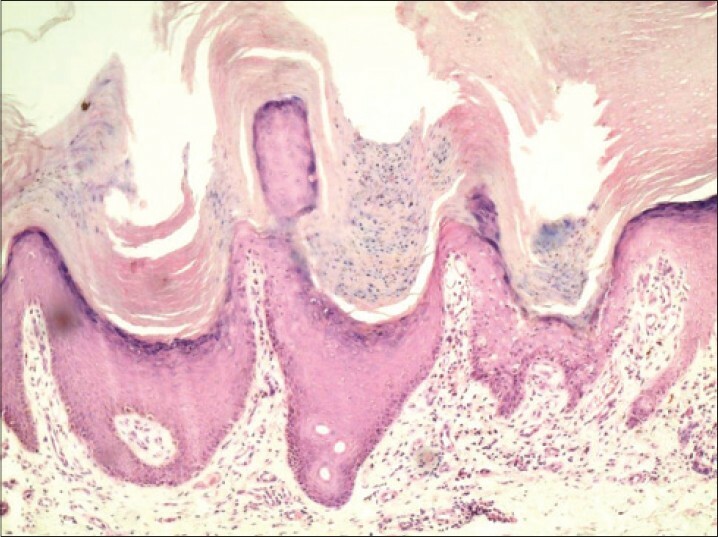 Histologically, this ridge corresponds to the cornoid lamella. It was first described by Mibelli in 1889 and since then many other clinical variants have been described. The recognized common clinical variants of PK include PK of Mibelli (PM), disseminated superficial actinic PK (DSAP), linear PK (LP), PK plantaris palmaris et disseminata, and punctuate PK. Earlier it was assumed that PK originates from the eccrine ostium, yet acrosyringeal and follicular involvement were considered to be relatively rare. Such involvement has been often discussed in conjunction with certain types, for example, follicular PK (FP),  porokeratotic eccrine ostial and dermal duct nevus particularly in a rare variant, the porokeratotic eccrine and hair follicle nevus (PEHFN). We describe the incidence of follicular involvement across the spectrum of PK in our population and describe the clinical and histological features of the same. The study was conducted in a tertiary care hospital in India. We studied all cases of PK diagnosed clinically that presented to our hospital over a period of 1 year. The clinical details, type of PK and histopathological features were reviewed and the presence of follicular and acrosyringeal involvement was documented. Multiple sections of each specimen were analyzed and the presence of cornoid lamellae associated with the follicular infundibulum of the acrosyringium were noted. In total, 28 lesions from 16 patients were analyzed. The age of the patients ranged from 16-48 years (mean age: 32 years). The clinical spectrum of the lesions that were biopsied is described in [Figure 2]. The follicular and acrosyringeal involvement in the various types of PK evaluated in this study are described in [Figure 3],[Figure 4],[Figure 5] and [Figure 6]. The follicular involvement was seen as parakeratotic columns arising from the lower third of the follicular infundibulum overlying an absent granular layer, dyskeratotic cells, and occasional vacuolar degeneration of the basal layer. The acrosyringeal involvement was seen as cornoid lamellae within dilated eccrine ostia. In all cases, except in FP, cornoid lamellae independent of the follicular infundibulum and eccrine ostia were also noted. In one retrospective study, of the 86 lesions biopsied, 21 had follicular involvement and 16 had acrosyringeal involvement. No correlation was noted between the subtypes. These results are similar to our study. The abnormal epidermal cell clones are thought to form parakeratotic columns at the boundary of epidermal appendages in the presence of intact stem cells of hair follicles and sweat ducts. The occurrence of the cornoid lamella in the lower parts of the follicular infundibulum and acrosyringium observed in our study support this hypothesis. Hence, the follicular and acrosyringeal involvement occurring in a number of cases across the clinical spectrum of PK is not surprising. A dermatopathologist must be aware of this finding and correlate with the clinical features before diagnosing follicular PK or PEHFN. We believe that the follicular and acrosyringeal involvement in PK is not restricted to a distinct entity and may occur across the spectrum of PK. Clinicopathological correlation is essential prior to diagnosing follicular PK and PEHFN. 1. Sertznig P, von Felbert V, Megahed M. Porokeratosis: Present concepts. J Eur Acad Dermatol Venereol 2012;26:404-12. 2. Porokeratosis of mibelli. Arch Dermatol 1968;98:325-6. 3. Rama Rao RG, Sundareswar B, Reddy PP, Padmavathi K, Lakshmi P. Porokeratosis-report of three unsusual cases. Indian J Dermatol Venereol Leprol 1998;64:286-8. 4. de Almeida HL Jr, Guarenti IM, de Castro LA, Rocha NM. 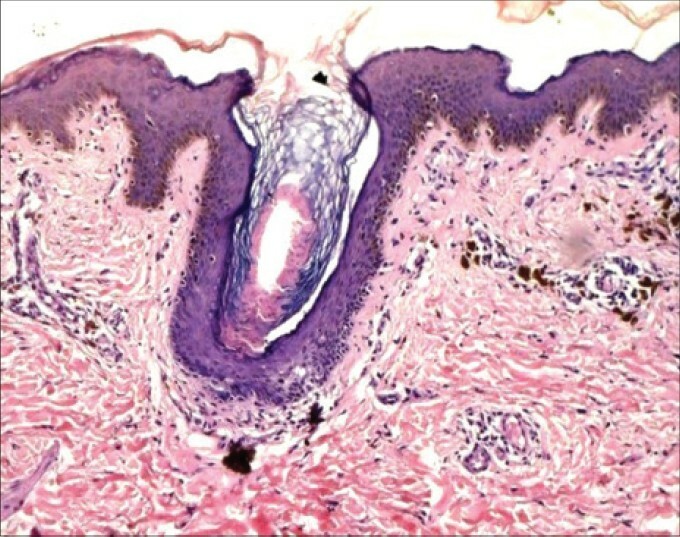 Follicular involvement in porokeratosis. J Eur Acad Dermatol Venereol 2007;21:109-11. 5. Pongpudpunth M, Farber J, Mahalingam M. Follicular porokeratosis: Distinct clinical entity or histologic variant? J Cutan Pathol 2009;36:1195-9. 6. Hartman R, Rizzo C, Patel R, Kamino H, Shupack JL. Porokeratosis palmaris et plantaris disseminata or a disseminated late-onset variant of porokeratotic eccrine ostial and dermal ductal nevus (PEODDN) with follicular involvement. Dermatol Online J 2009;15:8. 7. Schamroth JM, Zlotogorski A, Gilead L. Porokeratosis of Mibelli. Overview and review of the literature. Acta Derm Venereol 1997;77:207-13. 8. Sehgal VN, Dube B. Porokeratosis of Mibelli. A disease of eccrine sweat duct units. Acta Derm Venereol 1968;48:358-61. 9. Minami-Hori M, Ishida-Yamamoto A, Iizuka H. Cornoid lamellae associated with follicular infundibulum and acrosyringium in porokeratosis. J Dermatol 2009;36:125-30. 10. Rocha-Sousa VL, Costa JB, de Aquino Paulo-Filho T, Rocha KB, da Trindade-Neto PB. Follicular porokeratosis on the face. Am J Dermatopathol 2011;33:636-8. 11. Yong AS, Singh M, Goulding JM, Swale VJ. Follicular porokeratosis of Mibelli on the buttocks. Clin Exp Dermatol 2009;34:43-5. 12. Wang NS, Gruson LM, Kamino H. Facial follicular porokeratosis: A case report. Am J Dermatopathol 2010;32:720-2. 13. Vaishnani JB, Bosamiya SS, Sapariya BJ, Udhreja PR. Linear porokeratosis with follicular involvement. Indian J Dermatol 2011;56:460-1. 14. Masferrer E, Vicente MA, Bassas-Vila J, Rovira C, Gonzalez-Ensenat MA. Porokeratotic eccrine ostial and dermal duct naevus: Report of 10 cases. J Eur Acad Dermatol Venereol 2010;24:847-51. 15. Pathak D, Kubba R, Kubba A. Porokeratotic eccrine ostial and dermal duct nevus. Indian J Dermatol Venereol Leprol 2011;77:174-6. 16. Zhang ZH, Wang ZM, Crosby ME, Wang HF, Xiang LH, Luan J, et al. 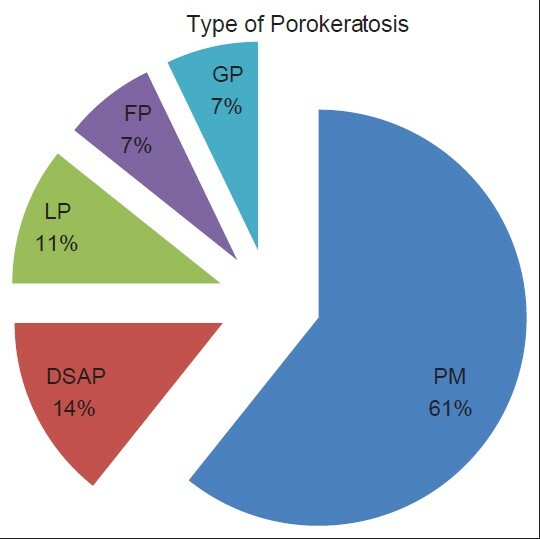 Gene expression profiling of porokeratosis. J Cutan Pathol 2008;35:1058-62.